Sleep deprivation is slowly but surely becoming the norm. In fact, Arianna Huffington goes as far to say that we ‘are in the midst of a sleep deprivation crisis’. Having just come back from the West Coast to Amsterdam, I can attest that interrupted sleep impacts your day. I am not alone. Six out of every ten adults are estimated to suffer from sleep deprivation. But it is one of the key health drivers. We spend about one-third of our lives sleeping for a good reason. Not getting the right amount or quality of sleep has been linked to a higher risk of certain cancers, higher blood pressure, coronary heart disease, diabetes, obesity, mental health issues, cognitive impairment and a whole host of other health issues. A lack of sleep can be chronic and life threatening in the long run. According to the 2018 Philips Global Sleep Survey, the majority of adults (67%) recognize the impact sleep has on overall health, even surpassing exercise, financial security and diet. Despite this recognition, sleep is not prioritized in the same way as other healthy habits. The recent survey found people feel more guilty about not regularly exercising or not eating healthy than maintaining good sleep habits. And it doesn’t only affect our health. Productivity also suffers. Rand Europe found that a whopping 1.2 million working days are lost in the US every year due to employee tiredness. Tech could provide a solution to combat this. So why are we so sleep deprived? According to Matthew Walker, a neuroscientist, there are many contributing factors. “First, we electrified the night,” Walker says. Conditions that are too bright are adverse for what we need for restful sleep. Secondly, he states that because as a society, we’ve begun to work more and commute longer that people are stealing hours from sleep to socialize with friends and family. Anxiety is also a factor – studies show that today people are lonelier and more depressed than in earlier years. Alcohol and caffeine play a role, as well. The 2018 Philips Global Sleep Survey found that more than 61% of adults have some kind of medical issue that impacts their sleep, including insomnia and snoring. Obstructive sleep apnea (OSA) is a common, widely underdiagnosed condition that can increase the risk of co-morbidities like hypertension, diabetes and heart failure. Sleeping too little clearly impacts us beyond the usual irritability. You have probably seen many articles professing that our increased reliance on mobile phones plays a major role, too. Innovation has been addressing this in recent years. At the Consumer Electronics Show in Las Vegas this year there was “an explosion of sleep solutions”. Already, there are commonly used wearable devices to track sleeping patterns and alarm clocks that wait for you to enter a lighter sleep before turning on, like the Philips Wake-up Light. Philips Hue lamps can mimic natural light (impacting our internal clock), shifting gradually to reflect day and night cycles in support of a better sleep. There are a host of new products including mattresses with sensors, bedroom temperature regulators, air purifiers and noise reducers. Some of the current sleep trackers also measure heart and breathing rate and use them to provide a rough estimate of sleep cycles as you move from deep to light sleep and back. The main trouble with these trackers however, is that they can mistakenly include the minutes when you’re lying still in bed, trying to drift off, as additional time asleep. They also can’t yet accurately monitor sleep stages, such as REM sleep (rapid eye movement). For now, the only way to monitor this accurately is by having an expert physically witness your eye movement in a sleep hospital or by tracking brain waves – neither option is realistic for a consumer wearable just yet. But we tackled that problem …. Philips recently launched a wearable sleep technology, called SmartSleep, clinically proven to help improve the quality of sleep for consumers who do not get enough sleep due to lifestyle. Studies suggest that deep sleep plays a vital role in resetting our brains to be more alert and focused. Think of it as clearing away all the detritus of the day. People who experience high quality slow wave sleep have been shown to be more alert and energetic during the day and have better memory consolidation. 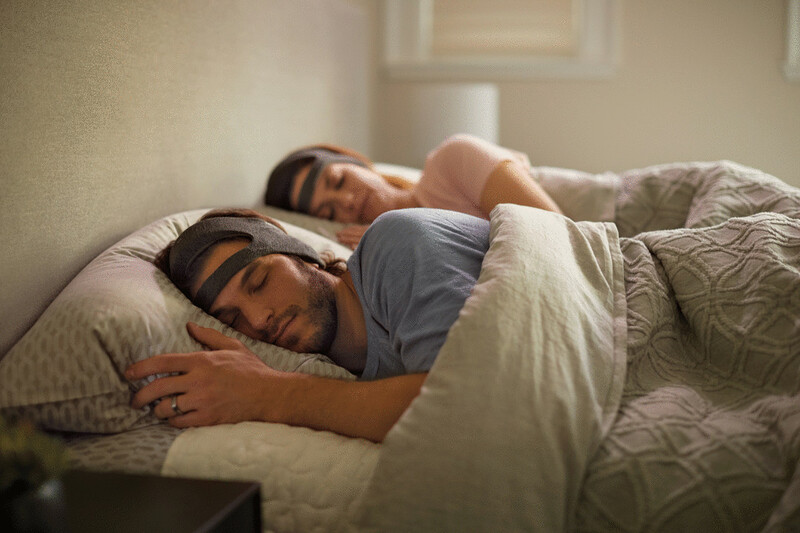 Unlike other sleep trackers that just monitor sleep patterns, this new sleep wearable is designed for people who typically sleep less to make the most of their resting hours. The device uses unique sensors to detect periods of slow wave sleep and intervene to boost it in real time, with customized audio tones that enhance the depth and duration of slow wave sleep. An accompanying app logs sleep improvement over time and provides tips on how users can get the best possible sleep, even with a busy, demanding lifestyle. As the Internet of Things and monitoring technologies develop further, we combine this with AI and population data to synthesize much more information about individuals’ everyday health. The right amount of sleep for you is personal to a certain extent, but according to Dr. Lauren Hale, Professor of Family, Population and Preventive Medicine at Stony Brook Medicine, it is also dependent on social determinants. Daytime stress levels, diet, medication and bedroom environment affect the way you sleep, but also factors such as the density of your neighborhood, education level and economic wellbeing. The next step in sleep technology will be capturing and integrating this contextual data to turn it into insights that will provide us with a better understanding of the big picture of sleep. From there we can further optimize our technologies, connect the dots, and provide the digital tools and coaching to support people and communities at large to sleep better and stay healthy. This approach follows from our perspective that health drivers and controls are highly personal and that precise diagnosis can help find the right-fit therapy. The data coming from connected devices will allow experts to gain a better understanding of how and when to intervene as problems arise. Sleep technology will continue to become more tailored to the individual for maximum impact. While we already have technologies, like our SmartSleep and CPAP devices, for those suffering from sleep apnea, your personal commitment to recognize your sleep issues and prioritize addressing them is an important part of the health puzzle. When you start using one of these products, you are also showing dedication to self-care. As I’ve stated before, when it comes to technology we are committed to a happy marriage of human and machine. Whether you’re a natural night-owl or you have a diagnosed sleep disorder – tech may help you get some well needed sleep. Jeroen Tas is Chief Innovation & Strategy Officer and member of the Executive Committee at Royal Philips. He has more than 30 years of global experience as an entrepreneur and executive in the healthcare, information technology and financial services industries. Jeroen is responsible for the company’s strategy, research & development, design, medical affairs, sustainability, platforms and emerging businesses. As Chief Innovations & Strategy Officer he plays a central role in the transition of Philips to a customer-centric digital solutions company. He will leverage emerging technologies such as artificial intelligence, robotics and the Internet of Things to reinforce the company’s health propositions aimed at supporting consumers, care professionals and health systems with personalized connected health solutions. Jeroen’s stance is echoed in Philips’ commitment to touch the lives of billions and improve better health outcomes at lower cost: from healthy living and prevention to diagnosis, treatment and home care. Earlier in his career Jeroen was co-founder of the IT company Mphasis and served as President, COO and Vice Chairman. He ran the Technology Lab at Citigroup and launched Internet banking in the mid-nineties.